Hello and a warm welcome to our new blog! Don’t forget your toothbrush, Valentines! Select Post... 11 January - Hello and a warm welcome to our new blog! 13 January - Don’t forget your toothbrush, Valentines! We’re so excited to be able to share with you all the news from The Moorings and everything we’re planning for 2017. Situated on the banks of the River Dee, our cosy restaurant is the perfect place to relax, unwind and watch the day go by. You can take a seat outside or enjoy the view of the river from inside. We’re open seven days a week serving breakfasts and lunches, delicious homemade scones and other naughty things. During the winter months (from November to March) we serve our Great British Sunday Roasts which are prepared using locally sourced, high quality ingredients. Over the last 12 months we’ve hosted some fabulous events that have included engagements, baby showers, birthdays and even a couple of weddings. We can organise parties for up to 50 people, working with you to design a bespoke menu to ensure your celebration is memorable for both you and your guests. Following the success of our guest chef evenings last year, we are now planning more for 2017 so watch this space! There’s always lots going on in Chester and we love to hear what people have been up to and where they’ve visited. 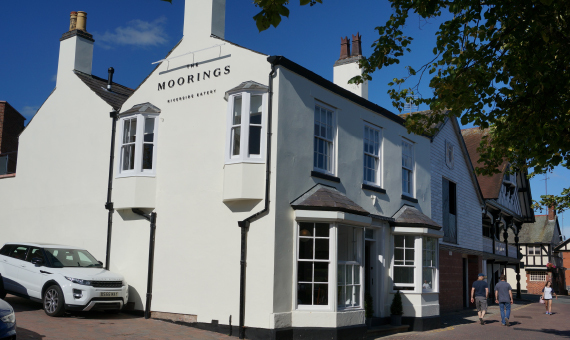 Chester Racecourse is a firm favourite with many visitors, so if you’re planning to go this year, why not pop over to The Moorings first for one of our race day breakfasts before heading off to place your bets. We’ll also be open during the evenings on race days serving sharing platters and plenty of Prosecco – so whether your celebrating or commiserating, what better way to end your day. We’re dog friendly too, so please do come in an introduce us to your four legged friend the next time you’re out and about. Our resident pooches Jackson and Daisy may even be around to say Hi! You can follow us on Facebook and Twitter, don’t forget to check in and tag us when you next visit.